Discussion in 'Community Chat' started by YellowAfterlife, Jan 12, 2019. Seeing the blue accent theme topic reminded me that I wanted to do a small theme for a while, so I did, and wrote up instructions on how to make themes that won't easily break between GMS2 updates. Note: not Program Files! Skins folder in PF will get overwritten whenever IDE updates. On Mac, it's likely in Application Data - check where runtime_feeds.json is via Finder. Open the Skins directory, or make one if it's not there yet. Extract your skin into a subdirectory in Skins so that you have Skins/<skin name>/Styles, etc. 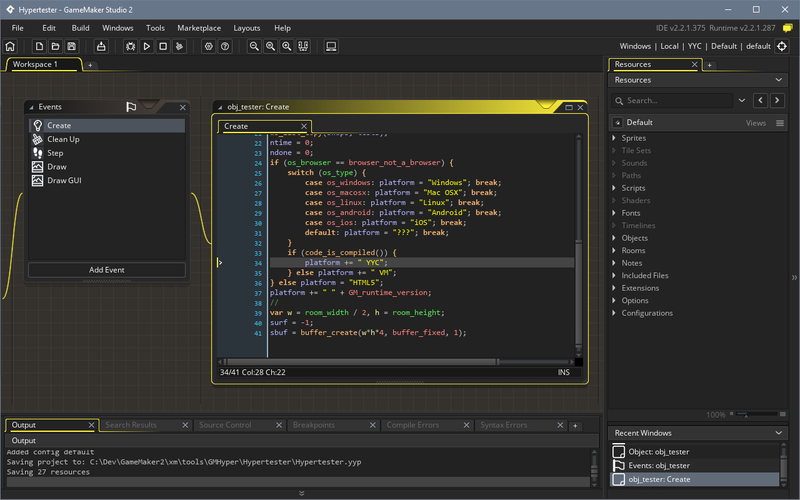 Choose the skin in GMS2 via menu:File - Preferences - General - IDE Skin. Andy, NeZvers, EvanSki and 3 others like this. jackquake and YellowAfterlife like this. Is there a way to get the default theme in file form? The default light and dark skins are located at "C:\Program Files\GameMaker Studio 2\GUI\Skins" (on Windows obviously). I had no idea we could make custom themes! I wish I actually owned a GMS 2 Desktop license! Dang this is beautiful. I'm going to give this a shot after the Jam! Thanks for sharing. I'll stick with green for now, but your yellow theme really does look nice. Good work!